Dental care of dogs and cats is one of the most commonly overlooked areas of pet health care. Approximately 80% of all dogs and cats have periodontal disease by the time they are only two years old. Dental disease affects much more than fresh breath. It frequently leads to more serious health problems such as liver, kidney and heart disease. That's why more veterinarians are not just treating dental disease, but taking new steps to prevent it. 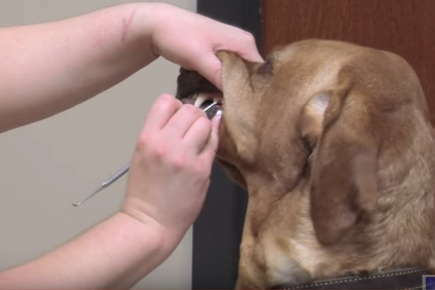 A major step in this process is encouraging owners to participate in their pet's oral health at home. Periodontal disease in pets is the same as it is in people. It's a sneaky and insidious process that begins when bacteria in the mouth attach to the teeth and produce a film called "plaque". When the bacteria die, they are calcified into "calculus" commonly known as tartar which makes a rough surface for even more bacteria to stick to. In the beginning, plaque is soft and can easily be removed by brushing or chewing on appropriate toys or treats. But if left to spread, plaque leads to gum inflammation (called "gingivitis") and infection. Eventually, the infection spreads to the tooth root and even the jaw bone itself - causing pain and tooth loss. The American Animal Hospital Association recently devised new guidelines for veterinarians in order to highlight the need for more professional oral hygiene care for pets. The organization stressed the necessity of going beyond the traditional "scraping the surface" of routine dental cleanings, known as "prophies". Veterinarians are encouraged to teach owners the importance of good oral hygiene when puppies and kittens are only a few months old in order to begin a lifetime of healthy benefits that go far beyond sweet smelling kisses. It's important for all pet owners to know that pets can lead longer and healthier lives with good dental care. In fact, studies show that proper dental care can extend a pet's life by as much as five years! Ask your veterinarian about good dental care for your special furry friend.